With extra buoyancy for offshore rough-water conditions, our Deep Water Automatic Inflatable Life Jacket was developed with offshore anglers and powerboaters in mind. Comfort and convenience define this life jacket. We designed this life jacket with comfortable and versatile features you need for offshore conditions. Our Deep Water life jacket is designed to automatically inflate when immersed in water. The automatic inflator won’t prematurely inflate due to rain or humidity as the dissolvable bobbin the inflator relies on must be submerged in water first. 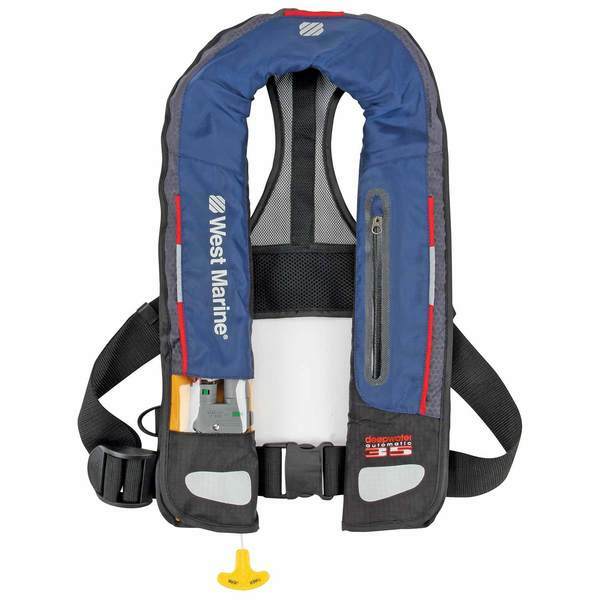 These versatile life jackets easily convert to manual inflation with the attached T-cord. You will want to visually inspect your life jacket for leaks or tears every few months and service the automatic inflator every two years. After inflation, rearm your life jacket with an inflatable PFD rearming kit (sold separately). Inflatable life jackets are designed to be lightweight and low profile, offering maximum mobility. The Deep Water’s design minimizes bulk so it fits well over your rashguard or offshore jacket and the wide neckline won’t hinder your movement. With its lightweight design and freedom of movement, you can wear this life jacket comfortably for extended periods of time. Conveniently comfortable features such as the breathable 3D mesh neck gusset and Air Mesh yoke, keep you cool on warm days. Constructed from 300-denier polyester and nylon material over the urethane coated nylon bladder, the Deep Water life jacket will endure years of wear in harsh conditions. A large zippered pocket provides a place for your car keys, wallet, VHF radio or PLB. Additional security and comfort are provided with 2" polypropylene webbing and the Delrin buckle. When inflated, the yellow bladder shows a reflective strip for improved visibility. Fits a wide range of chest sizes from 30"-56"